Black Diesel from Advanced Seeds is a strong diesel plant, this strain is much loved and is therefore a popular strain. 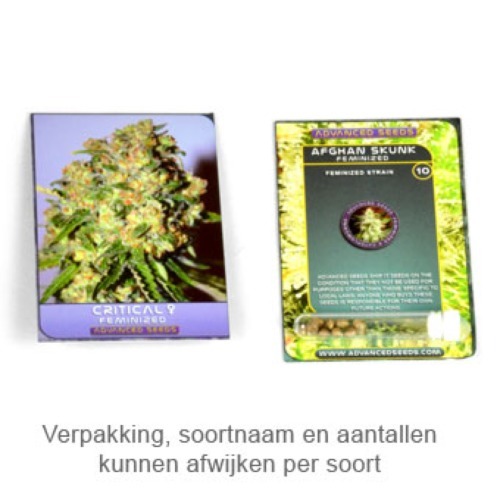 The cannabis seeds are feminised and from high quality. This strain contains mainly Sativa genetics and is very powerful. Advanced Seeds Black Diesel cannabis seeds are appropriate for an indoor grow and outdoor grow, but she is not happy with a too humid environment. When you grow this plant indoor, she will not become large but in the full ground it will become a huge plant. Black Diesel tastes like grapefruit, with the notorious diesel taste. This weed contains a high content of THC (19%) and you will feel her immediately after smoking. Growing cannabis from these feminised cannabis seeds is quite easy. Tell us and our customers what you think of the Black Diesel from Advanced Seeds.